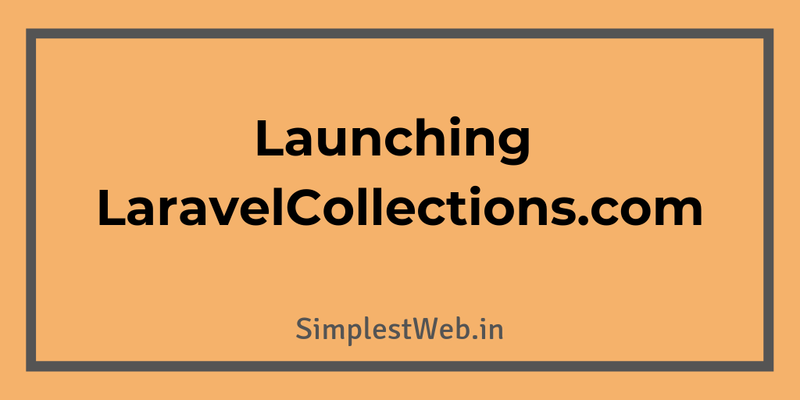 Hi There, in this article I wanted to share with you my experience of launching a new side project - LaravelCollections.com. I will go through what the site is about, the reasons behind it, how I promoted it and the lessons learned. Let’s get going. You should know that this is the first side project that has more than one regular user (that 1 being me of course). The reason behind the site? Even before I needed validation, I knew this idea had some potential. But to be sure, I purchased the domain, set up a basic landing page and wrote why I am making this site developed. The landing page also included an email signup form, this way if someone signed up, I could know that they were interested in seeing this site. I posted about the landing page on Reddit, Twitter and Facebook groups to drive traffic. Sure enough, about 5% of the traffic signed up. I assume that the signup rate was high because I only informed about this on developer communities. After about a week, I had 25+ signups. It was more than enough to validate my idea and realize that there was a need for a resource such as this. I started work on the actual site, once I started receiving email signups on the landing page. Since the site was pretty basic in terms of complexity, I have no trouble building a working site over a weekend. I was quite happy with how it turned out, so on Monday (Dec 18, 2018), I decided to make it public. Few hours after making the site public, I announced about it on Twitter. This tweet kind of exploded relative to my other tweets, that barely have a few impressions at best. You should be told about my Twitter stats, I had 6 followers and one of which was a bot (according to Twitter). I would like to think that I used the right hashtag. This tweet alone drove tens of visitor on the first day. The next day, I decided to promote the site in all possible places. I had prepared a huge list of sites where I thought I could talk about LaravelCollections.com. This worked, big time. One of those sites were Laravel News, they have a huge following of Laravel Developer and they posted about my site on their twitter and facebook page. It was nuts after this point, their shares brought in hundreds of visitors and tens of email signups. Overall I think the launch went far beyond my expectations. I feel more confided about the site, now that I know, fellow Laravel Developers are interested in my site and are willing to see the site grow. I learned quite a few lessons getting the site to this point. Some of them might sound cliche but they are not any less true. Validating an idea helps you find out if there’s a crowd for what you are building. When you know that there’s an audience, you feel that much more confident about work on it. Put up a landing page it barely takes about an hours work. Focus initially on promoting at places you know where your target audience hangs out. I think promoting elsewhere is just a waste of time. Have some way for the user to provide feedback. Google Analytics is not just for viewing visitor count, if you use it right, it can help you understand your users’ behaviors nd you can optimize your site accordingly. Reply to email and messages, this may seem simple and obvious but my users have given me ideas, I could not have thought of, at the expenses of a few minutes replying to their message. There’s always someone saying “What’s the point?”, try convincing them, that’s the biggest lesson I learned. I want to dedicate more time for the site from my usual freelance work day. I have a list of features in mind that I want to work on. It will be great to see how the Laravel Community uses the site in the long term. I will write to you in a month’s time, updating on what’s going with LaravelCollections.com. That’s all for now, have a good one. You can know more about me and my work at Simplest Web.